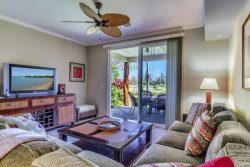 This beautiful end-unit villa offers three bedrooms, three bathrooms and has one of the most private locations in Waikoloa Beach Villas. Waikoloa Beach Villas is one of the most desirable communities for vacation rentals within the resort. Its excellent location directly across the street from the Queens' Marketplace and next door to the Kings' Shops you have excellent restaurants, shopping, market and coffee shops. Anaehoomalu Bay (also known as A-Bay) is less than a 15 minute walk while the other world class beaches of Mauna Kea Beach and Hapuna Beach are less than a 15 minute drive. Every guest can sit back and enjoy their time together in this magnificent villa. The open and inviting living room features a large flat screen TV and comfortable designer furnishings. A gourmet kitchen is every chefs dream and comes fully-equipped with stainless-steel appliances. The indoor dining area seats six with seats for four more at the breakfast bar. The outdoor dining area is in close proximity to the kitchen and living room and features artistic patio furnishings, a built-in BBQ grill and a dining table with seats for four. Upstairs is the master suite with king bed and an attached bathroom, and there is a junior suite with queen bed and an attached bathroom. Also, there is a loft area with one sofa sleeper and a flat screen TV, along with a full size washer and dryer. Downstairs is a guest bedroom with a queen-size bed and full bathroom right next door. Waikoloa Beach Villas has two swimming pools, two hot tubs and a fitness facility it is one of the lowest density communities in the resort. This property is impeccably maintained and outfitted with quality furnishings and finishes, beach gear (at minimum two beach chairs, two boogie boards, cooler and umbrella) and everything you need to make this your ideal home away from home for your vacation. The villa also includes a basic “start-up supply” of: laundry detergent, garbage bags, kitchen sponge, liquid soap, dishwasher tabs, paper towels, toilet paper, shampoo/conditioner, small bar soap and salt/pepper. Cooking oils and spices are not provided. Once the startup supply runs out, guests are on their own to purchase additional supplies if needed. Cleaning solvents are not supplied. The Villa is located close to the Queen’s Shops, a quaint shopping destination complete with art galleries, a gourmet grocery store, clothing boutiques and some of the best dining available such as Sansei’s Steak and Seafood, Aloha Bar and more. They also have a convenient food court with “upscale fast food” such as Lemon Grass. The “King Shops” are also conveniently located, with exclusive high-end retail stores and restaurants. Excellent communication, friendly and helpful . Highly professional. Many thanks to Ms. Anne Marie Moynahan and to the whole Resortica team! We are a group of 3 married couples (all around 60) and we spent an excellent week at the E1-Villa. The property is even more beautiful than on the photos. It is clean, elegantly furnished, perfectly equipped for 6 people and has an excellent (quiet) location with the patio enabling full privacy. Waikoloa Beach Villas is, in overall, an excellently kept resort. The Hilton Pool Pass is an additional plus if there is a family with kids or to chill-out after a long ride to Mauna Kea or a round of golf. However the Anaehoomalu Bay is just awesome in the morning and for the sunset We look forward to coming again!